I have always been a big admirer of Barbara’s. Not only is she a great cook who shares her delicious recipes on her fabulous blog, Winos and Foodies, she is also the creator of Hay Hay It’s Donna Day, one of my favorite blogging events. She takes the time to organize events, answer all our comments, and post pictures of her beautiful New Zealand (a place I am now longing to explore). All this while fighting cancer. The strength and aplomb with which she approaches everything is remarkable. So when she put out a call to food bloggers everywhere to participate in A Taste of Yellow, a blogging event to raise cancer awareness, I definitely was not going to miss it. LIVESTRONG Day is the Lance Armstrong Foundation’s (LAF) grassroots advocacy initiative to unify people affected by cancer and to raise awareness about cancer survivorship issues on a national level and in local communities across the country. LIVESTRONG Day 2007 will occur on Wednesday, May 16. Cancer touches everyone’s life, whether it be our own, or that of friends and family. I have had family members fight this terrible disease…some triumphant, and some not. Three days ago we lost an uncle to cancer. I myself have experienced the fear that comes with discovering a lump in your breast. I thank God and all my lucky stars that it was nothing serious, but because of this I have been having mammograms and sonograms (to monitor) since before I was 30. My mother (a very wise woman) always says: “Knowledge is power…don’t be scared to find out…learn…own it!” And I suppose this is what awareness is all about. Not being scared in the darkness of ignorance, but fearless in the light of knowledge. And so A Taste of Yellow…the color of sunshine and light! We can make anything we want as long as it features a yellow food and I have decided to make a very simple dish containing one of my favorite yellow foods around…eggs. 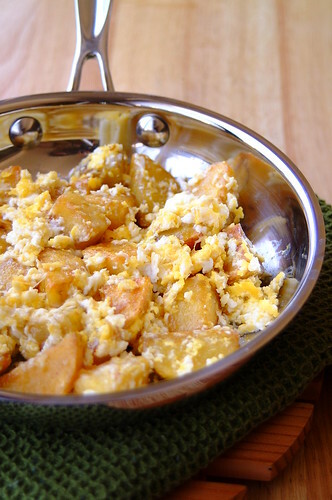 Huevos Estrellados (or more commonly known as Huevos Rotos) is a very down-to-earth, homey kind of dish. 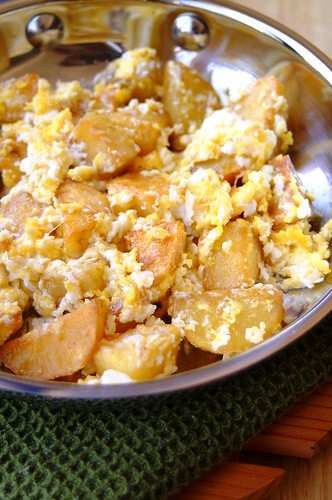 It’s basically “broken” eggs with potatoes. You can vary it in countless ways by adding mushrooms, onions, garlic, chorizo, roasted peppers, or whatever you can think up. I kept it plain and yellow here. – In a pan, heat oil slightly and add potatoes. Cook over very low heat. You don’t want to sear them just yet. You want to slow cook them in the olive oil until they are soft, and then wait until the edges get golden and crisp. Don’t rush this. It’s worth it. – Once your potatoes are soft and golden, with edges that are as crisp as you want them, pour in – egg whites and stir for 3-5 seconds. – Turn off the heat and stir in yolks until done to your liking. Season with salt and transfer to a plate (or the heat from the pan will keep cooking the eggs) and eat immediately. We ate this for brunch with English bangers and local longganisa. Delicious and satisfying! Make sure to check back at Barbara’s for the round up on May 16!